Not all houses are designed to efficiently relocate water to a safe location, and this leads to serious problems and costly repairs for many homeowners. 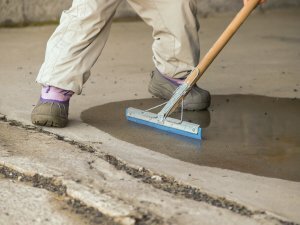 Fortunately these individuals can seek drainage correction and waterproofing near San Antonio to alleviate these concerns and enjoy the peace of mind that they deserve. Your professional drainage correction team can help you preserve the integrity of your concrete by removing excess water and moisture from the foundation of your home. Read on as we put the spotlight on drainage correction. Water that pools around the foundation of your home can quickly find its way inside your home. When moisture is allowed to sit within the walls of your basement or the floors of your living room, complications such as structural damage and mold growth may develop over time. Your drainage correction professionals can redirect water from the foundation of your home to a safer location where it will not cause any damage. Your team of specialists can perform a range of drainage correction services including French drains, grading, swells, and basement waterproofing. These techniques will keep water from entering your living space and hindering your home’s indoor air quality and structural soundness.